One book in particular has been crying out to be read from my TBR pile for twelve months. I’ve held off, but with the dread that someone or a casual word somewhere would give away the ending of a story and book that has come so highly recommended. At last I’ve finally had the chance to read Six, Karen Tayleur’s brilliantly tense and riveting YA coming-of-age story. This out-take from the prologue, alongside the four line story rhyme introduction (each chapter features) There were six in the bed, and the little one said, ‘Roll over, roll over’ So they all rolled over and one fell out…suggested to me that only one character survives the car crash so hauntingly shown in aftermath within the prologue. The tension builds as you come to know each of the six main characters, shown through both first and third-person viewpoints, and fret over who may or may not survive. I’m not giving anything away, except to say I was shocked and that the ending is inspired, brilliant, inescapable. 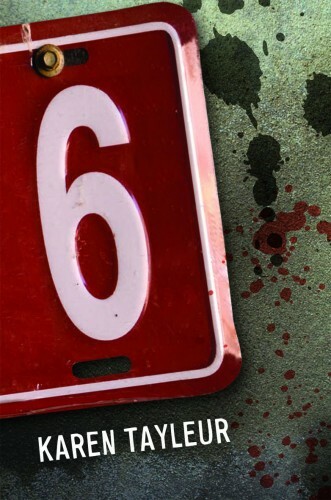 Six – a fantastic read, and read again book. Highly recommended. I couldn’t agree more, Chris. This is a fabulous book (one of my all-time favourites). It’s brilliant on every level and should be given to all young people before they ever get behind a driving wheel or hop into a car driven by a young friend. It is award-winning material . . . definately! I think the multiple levels is what makes Six such a winning formula. It’s a great story, and a really accessible read that I think YAs will very much identify with; a nail biting thriller too showing a fun night that turned deadly in a blink as is usually the way. Fantastic showing without an ounce of didactism. I’m in awe. Oh Chris, I read 6 over these Christmas holidays and LOVED it too. Such a clever story, and very readable. Every character seemed so real, they were like people from my own teenage memories. Julie. Hi Chris, good to see you doing some holiday reading. I have nominated you for a Versatile Blogger Award. If you are interested, pop over to my blog and check out the conditions. Hi Liz, thank you very much for your Versatile Blogger nomination. I’m excited. I’m going over to your blog right now and check it out. 🙂 Chris.